Guess what??? It’s Monday and I have the day off with my husband. I’m SO excited! Before I became permanent and my schedule changed, we had the weekends off together, but now we only get one day off together once every five weeks so it’s cause for celebration. I’m going to relish it. These would be great for your St. Patrick’s Day festivities! For the mint filling, place the chocolate chips and heavy cream in a small microwave-safe bowl and heat for 1 minute at 50% power. Stir. Repeat the process until the mixture is smooth. Stir in the peppermint extract and powdered sugar, whisking until smooth. Let the mixture cool to room temperature (but don’t let it get too stiff) and pour it into a disposable pastry bag fitted with a small round tip, or a squeeze bottle with a tip. Insert the decorating tip or tip of the squeeze bottle into the center of the cupcake and press gently to fill the middle of the cupcake with the mint ganache. You can be pretty generous, squeezing until you see the top of the cupcake start to rise a little. Repeat with the remaining cupcakes. For the frosting, in a large bowl, beat the cream cheese and butter until light and fluffy. Add the powdered sugar and mix until smooth. Add the heavy cream and peppermint and vanilla extracts. Beat until light and fluffy. Add green food coloring until the color you like is achieved. Frost the cooled, filled cupcakes with frosting (using a large star tip, I used Wilton # 1M) or simply spread the frosting in a large dollop (again, you can be generous-there is plenty) with a butter knife or flat spatula. 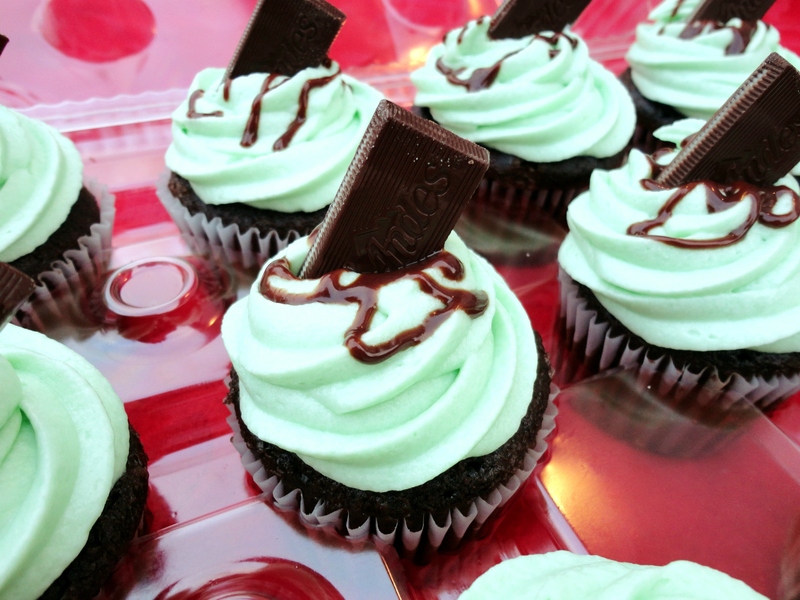 Garnish with a drizzle of leftover ganache (make sure the ganache is completely cool or it will melt the frosting when you drizzle it on top of the cupcake), and an unwrapped Andes mint. Serve at room temperature. *I used a devil’s food cake mix, but this is my favorite from-scratch chocolate cake recipe. Your Klingon Kung Fu is strong, honey. Reminder: this is the last week to get your postcards out to Beverly! You can get the deets here if you missed the announcement: Operation Postcard for Beverly. Posted in Cake & Frosting and tagged andes mints, cake, celebration, cupcakes, dessert, food, green, mint, party, St. Patrick's Day. Bookmark the permalink. I love mint! Awesome pictures! amazing! i want one now! That is so funny. I made an easier, white cake version of these just the other day, I thought about making ganache but life with teenagers is quite hectic lately…. so I settled. Actually, it was quite good! 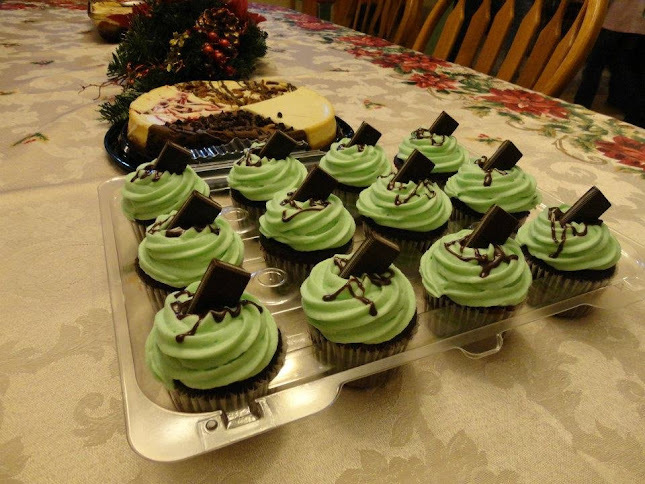 I love how you used chocolate cake and made cupcakes !! The picture of the awkward man-hug tickles my funny bone! Sorry, Suzie, I used facebook photos again! I knew you wouldn’t be able to see them-I’m such a trouble maker. Yum!!!!!! Hey unfortunately I’m going to miss that thing in April…. My Austin move has went quicker than I thought & moving in to my new place on 3/24!! Veronica, these sounds quadruply delicious! I can see why everyone went crazy over them and the party looks so fun! Anyway, I really want to be able to do this and necessity is the mother of invention, right? We have no local bakeries that make beautiful cupcakes like these in my neck of the woods. And I’m betting they taste even better than they look. Thanks for the great recipes, tutorial, and inspiration, Veronica!